DELETE ALL DRUNK SEXTS AND PRETEND THEY NEVER HAPPENED | The People I Slept With. There should be some sort of device that prevents drunk people from sending texts! I’m glad I’m not alone! But sometimes ‘drunk texts’ are good, when I was young, immature and clueless they were an ideal method of trying to get away with saying something that I really meant because if it backfired and they were like ‘I don’t like you, leave me alone’ I could just pretend I was really drunk and was supposed to be texting someone else! I never send out drunk texts. 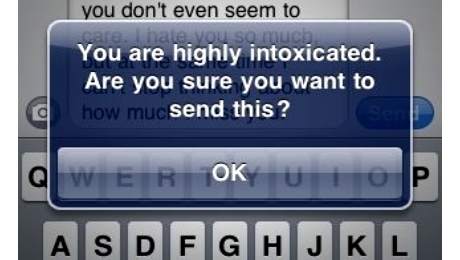 By the time I get to my phone, I might be too drunk to text. Drunk texting is officially my worst habit. Though if you have an iPhone, there’s an app called Dignity which will temporarily delete your contacts for a certain amount of time. It’s my new best friend! I’ll have to try it! I love the image with this post! Drunk texts and drunk sexts are nightmares in digital form…and if you erase them while drunk and you’re unaware the next day, it becomes a form of detective work solving a case to determine the level of a fool you’ve made of yourself. Of course I’m speaking about myself!